With the summer season upon us, hopefully it will bring some clear skies. For those of you interested in some alternative summer night activities, our Mappa selenographica (Berlin : Simon Schropp et Soc., 1834) may be of interest to you. Measuring almost 1m in diameter, it is a detailed map of the surface of the moon by the German astronomers Beer and Mädler, and is generally accepted to be the first exact map of the moon. If you would like to view/ consult this item, please submit an online request or contact the staff of the Special Collections Reading Room in the Hardiman Research Building at specialcollections@nuigalway.ie and prepare to while away a couple of hours in its contemplation. 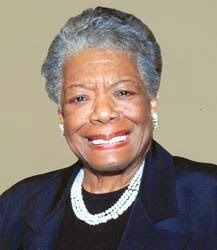 Maya Angelou died May 28th at the age of 86. She was a great advocate of libraries and often spoke of the value of libraries and education in her life. “I always knew from that moment, from the time I found myself at home in that little segregated library in the South, all the way up until I walked up the steps of the New York City library, I always felt, in any town, if I can get to a library, I'll be okay. It really helped me as a child, and that never left me. So I have a special place for every library, in my heart of hearts.” — In "Interview: How Libraries Changed Maya Angelou's Life"
Our SFX experienced technical issues for about 60 minutes yesterday, 28/05. This was due to a global technical issue with the service providers. Once again, our apologies for any inconvenience this may have caused. We would like to thank everyone who visited the AWC this year and to invite all of you to fill out a survey. The survey is very short. We would be very grateful for your help in making the AWC a better service. who would like to improve their writing skills ahead of next year. Depending on student demand, the camp is likely to take place in the last week of July or first week of August. The 12-month trial of the online resource British and Irish Women's Letters and Diaries expires on 14 June 2014. Please complete the online feedback form if this resource is of interest to you. Spotted on the online film archive of British Pathè recently is this gem of a film regarding the return of the historic mace and sword of Galway City. The sword and mace, both beautifully crafted by local silversmiths in the early 17th Century and early 18th Century respectively, with the great mace being presented to the town of Galway by Edward Eyre, Mayor of Galway, in 1712. When Galway Corporation was dissolved in 1841, and as the Pathè film recounts, the then Mayor of Galway was owed considerable salary in arrears and he was given the two insignia." The items were later sold to an art dealer by the daughter of the Mayor and the mace and sword were eventually bought by American newspaper tycoon, William Randolph Hurst. The mother of Hurst, Phoebe Elizabeth Hurst, neè Anderson, was of Irish lineage with her family having connection to Galway. Prior to this transaction of sale of the mace and sword, it was noted in the Galway Observer, January 28, 1933, that: "It is learned that the Galway Urban Council has been in communication with a Government Department and has represented to the latter the necessity for purchasing the Sword and Mace of the Old Galway Corporation and housing these in the National Museum. The Government reply, while non committal is couched in sympathetic terms. Through the recent reports in the public Press in reference to the discovery of the Sword and Mace of Galway Corporation and their presentation probably when recovered to the National Museum, the epithet "Blakes of Galway" has come again into popular prominence says the "Tuam Herald" the student of history may remember these historic emblems occupied at one time their allotted positions in the local Council Chamber, until 1841, when through the passing of the Municipal Corporation Act the Corporations of Galway was dissolved. At the time financial stringency was so acute that the salary £8,000 due to the Mayor, Mr. Edmund Blake was liquidated before the Corporation went out of office by the handling over of the Sword and Mace to the Mayor. When Mr. Edmund Blake died in 1905 the sword and mace came into possession of his daughter, Miss Anne Blake, who decided to dispose of them a few years after. The Civic Emblems were then sold to Mr. Louis Wine, art dealer, of Grafton Street, Dublin, who now possesses them." The mace and sword were purchased in 1938 by Hurst and did end up going to America to reside in Hurst Castle, San Simeon, California and there they remained until 1961 when they were returned to Galway by the Hurst Corporation, following the death of William Randolph Hurst in 1951, as a gesture to the city and people of Galway. The ceremony to mark this event was attended by a large crowd and took place at the Aula Maxima here on campus of then University College Galway. The ceremony was attended by Taoiseach Sean Lemass and Mayor James Redington of Galway. Press coverage of the return of the mace and sword from the Milwaukee Sentinel can be read here and Here. Today and since their return, the Galway Civic Sword and Mace reside here in Galway and are in the Galway City Museum. Great to have them here at home! For more and related collections here at the Hardiman Library, you may be interested in Galway Corporation (1485 - 1818); Galway Town Commissioners records (1836 - 1899); Galway Urban District Council records (1899 - 1922) and also the archive of Prof. G.A. Hayes-McCoy. For more on the Archives and Special Collections of the Hardiman Library, click here. It’s that time of year again – almost six months since our last break from the office, and our pale skin and frayed nerves are longing for a holiday. 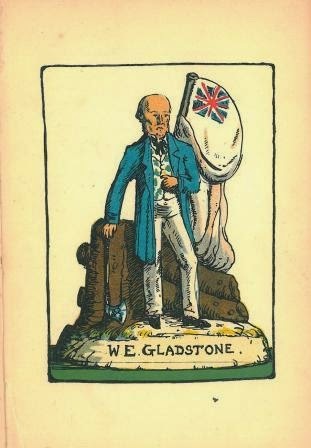 Why not take time out to consider the trips of yesteryear as illustrated in our early printed books. - How best to search the EBSCO platform etc. Hoax ’phishing’ email messages are currently in circulation on both the staff and student email services, some of which have a subject line: "Service Desk Ticket #324125". 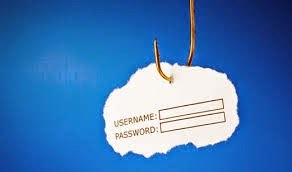 This email provides a weblink and requests the user to provide login credentials. Please delete this mail if you receive it as it does not originate from ISS or other legitimate source in the University. ISS have now blocked the source of this email and connection from wired on campus PCs to the website in the link provided. WiFi and off campus users can still access this link and as above shouldn’t provide their login credentials. Please be reminded that Information Solutions and Services (ISS) do NOT and WILL NEVER request details of your password by email. If you receive a message asking for your email account details, delete it without response. If you have already replied to emails of this nature or clicked on a web link within an email and provided your password, please contact the Service Desk (Tel. x5777 eMail servicedesk@nuigalway.ie) to ensure your account has not been compromised. Following NUIG’s success in the intervarsity BioBlitz earlier this month, beating UCC, DCU and Trinity in a 24-hour battle to find out which campus is the most biodiverse in Ireland, why not take time out this week to enjoy some biodiversity of the past. Printed in Dublin in 1850 by James McGlashan, the Concise notices of British grasses, best suited for agriculture by David Moore (1808-1879) includes 60 dried specimens, the condition of which is remarkable. Appointed director of the Botanic Gardens at Glasnevin in 1838, this publication is just part of his body of valuable research on the native grasses of the British Isles, and his recommendations regarding species for the composition of good pasture is perhaps a precursor to our modern concern for the variety of life and healthy ecosystems worldwide. 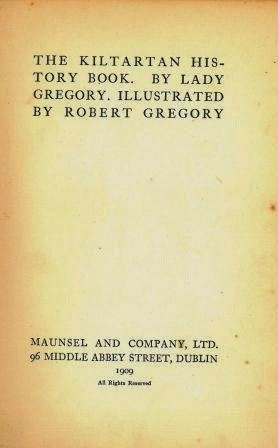 In honour of the grand opening of the Hardiman Research Building, our book of the month for May is the Kiltartan history book by Lady Gregory (1852-1932) (Dublin, Maunsel & Co., 1909). Writer, folklorist, adventurer, actress, and friend and supporter of many of the great writers of the period, Lady Gregory was involved in the founding and functioning of the Abbey Theatre, writing, acting, directing, and supporting playwrights such as J.M. Synge, Sean O’Casey and Lennox Robinson. She also wrote for children. The Kiltartan History Book was illustrated by her son, Robert Gregory, who died during the Great War and whose death is immortalised in W.B. Yeats’ poem An Irish airman foresees his death. Our copy was part of the library of the actor, Arthur Shields, which was presented to the James Hardiman Library in 2006.